Since my trip to Chicago earlier this spring, I've been desperately trying to find cheese (or vegetable) enchiladas with a verde sauce. I can buy Amy's frozen enchiladas in the store any day of the week, but up until this past weekend when I made an amazing discovery at Luchita's, I wasn't able to find any Mexican restaurants around town serving what I've always thought was a fairly common entree. I happened to be in Hudson on Saturday making a cupcake run (more on that later) with a few of my friends. Picking out cupcakes from the 20 varieties served daily at Main Street Cupcakes is hard work, so after that, we decided to grab some lunch at Luchita's. After chowing down on the free chips and moderately spicy salsa, I ordered a cheese enchilada with verde sauce. I debated over getting the vegetable enchilada with verde sauce or the cheese enchilada, but cheese ultimately won the race. When made correctly, cheese enchiladas are just so good! I had high expectations for these enchiladas. And I wasn't let down. I honestly think these enchiladas were some of the est enchiladas I've ever eaten. Despite being a cheese enchilada, my food didn't taste overly heavy or greasy. 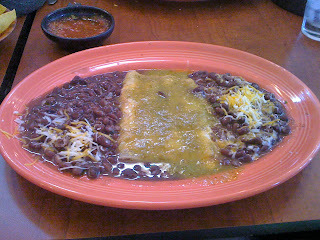 The black beans also served as a nice accompaniment and tasted even better with some of the runoff of the verde sauce.